Breakout sliding door can be also called as slide&swing door or sliding swing door ,it created a new class of multi slide door by combining the preferred features of wide door opening space and unobstructed view required by ICU/CCU room. 3 SAMEKOM have 50series and 80series ICU room door.All aluminum frame is 3.0mm/3.5mm up 6063 series.door body structure using T108 steel screw fastening the door body. 4 Glass will be 10mm tempred glass ,with excellent hardware accessaries . 5 Double heavy high power motor,maximum load up to 300kgx2. 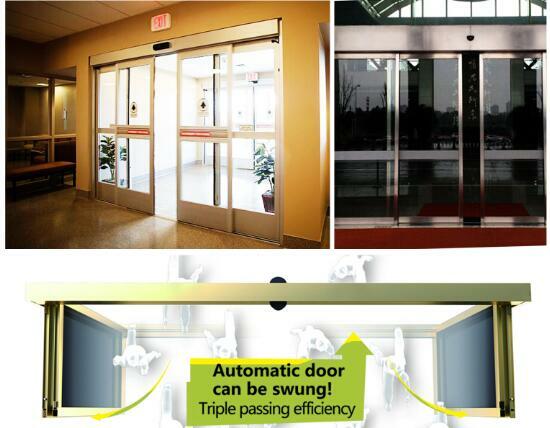 5 Waranty :2 years Warranty .Our doors fulfill national fireprotection standard(GB50016-2006) and national standard of automatic doors(JGT177-2005),passed 2million times opening and closing test .Droop proof design passed 300,000 times swing test.which eliminate raised thresholds that could shake and disturb patient beds or sensitive equipment as they are being transported through the doorways. For US ,Canada,Australia ,most part of Europe we can offer door-door service .